A relationship between sisters can be a complicated thing: ups and downs throughout childhood, a divergence of paths as you reach adulthood. 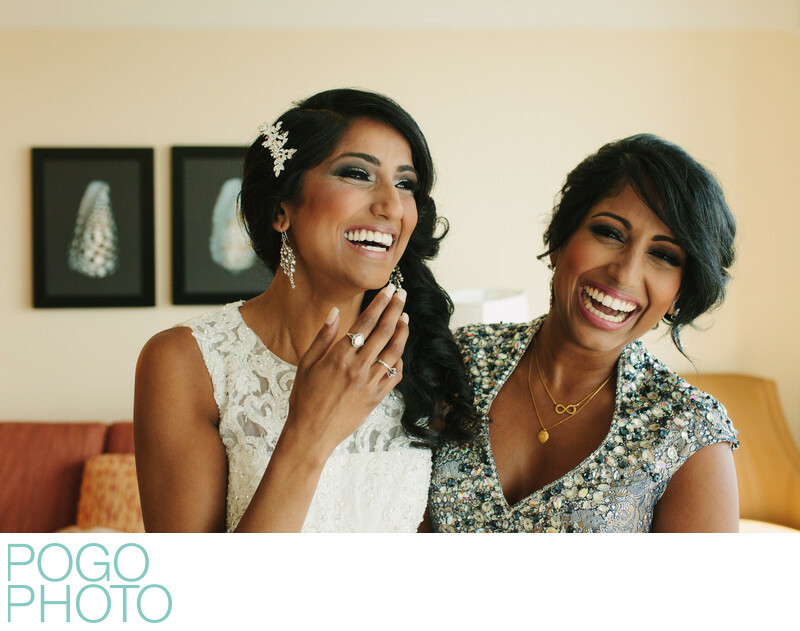 Coming together for a wedding can bring out the best of these relationships, as clearly evidenced by this laughing bride and her maid-of-honor sister. Their grins and giggles are infectious, and natural images such as this one, an "outtake" from a collection of posed formal images, showcase genuine emotion and excited giddiness for the upcoming events. Feeling comfortable enough to express joy in front of your photographer is essential to winding up with a collection of wedding images that show more than just who was involved: they'll show how they felt and how you felt. Show your teeth when you laugh! In fact, stop thinking about your teeth at all. Laugh from deep within when you are moved to laugh, and stop worrying about how you look. In fifty years when you look back on images of yourself as a pretty young thing laughing without a care in the world, you will be filled with that joy all over again in a way that no posed image will ever show you. Returning home for a destination wedding where you grew up can be a great way to involve local family and friends from your early years. This couple returned to South Florida for their wedding though they'd been living in Southern California for several years. Being back home amongst their loved ones was not only wonderful for their celebration, it also prompted them to move back home; the experience of being back in West Palm Beach made them realize just how much they missed it. Location: City Place, West Palm Beach, Florida. 1/250; f/3.5; ISO 1600; 35.0 mm.